Participation in the Aikido training is always possible without any notice in advance. In the beginning, normal workout clothes (with long trousers) are sufficient. 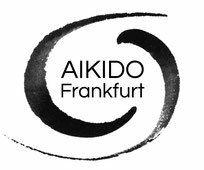 We offer Aikido suits (Keigo-Gis) from Ginkgo-Budo at favourable prices. In our system - all adults practice together, whether they are beginners or advanced students. Advanced Aikidoka will gladly support you in your development. The Georg-Büchner-School is located in Bockenheim south, a central district of Frankfurt. The sports hall is easily accessible from Frankfurt city centre. It is a 5 minute walk if you get off at the ‘S-Bahn’ station "West" (take any of the trains S3-S6 from Frankfurt Central Station in the "Messe" direction and it is the third stop along). It is also just 3 minutes’ walk from the tram stop "Kuhwaldstraße". Find out about your connection on the RMV website (tickets for zone 50). Entrance to the gym: Access the schoolyard from Pfingstbrunnenstraße and walk along the right side of the yard to the very end. The dojo is in the small flat gym building labelled "D" in the far right corner of the premises (next to the tarmac sports court). Nied is a western district of Frankfurt, easily accessible from the city centre. There is a very good public transport connection to the Niddahalle gym where the dojo is located: the quarter-hourly ‘S-Bahn’ service takes just 6 minutes from Frankfurt central station (get a ticket for zone 50). Take either the S1 to Wiesbaden or the S2 to Niedernhausen and get off at "Nied" (2nd stop). From "Nied" S-Bahn station it is only about 500 meters to walk (go East down Oeserstraße). Alternatively, exit tram line 11 at "Birminghamstraße" and walk about 500 meters (go North up Birminghamstraße). Find out about your connection on the RMV website. Via A5: exit "Westkreuz Frankfurt", follow A648 to "Frankfurt Stadtmitte/Messe", exit at "F-Rebstock". Via A66 from Wiesbaden: follow A648 to "Frankfurt Stadtmitte/Messe", exit at "F-Rebstock". Via A66 from Frankfurt city center: follow A5 to Basel, then follow A648 to "Frankfurt Stadtmitte/Messe", exit at "F-Rebstock". There are parking facilities right in front of Niddahalle. Entrance to the dojo: Enter the building via the back entrance. Due to reconstruction the practice is in the hall on the 2nd floor. Follow the stairs up to the right, then turn left. Changing facilities and showers are in the basement and on the ground floor.